The Ivanhoe River Inn is located between on Ivanhoe Lake, between Timmins, Ontario and Chapleau, Ontario off highway 101. Our operating season runs from May to November. We cater to fishermen, hunters, and many others seeking relaxing experiences in pristine nature. Our closest town if called Foleyet, a community of about 150 people, and Chapleau and Timmins are both about 60 miles away (east and west). The Ivanhoe River Inn is built on the shorelines of Ivanhoe Lake, and offers a restaurant and bar, a complementary pool table, free highspeed wireless Internet from our satellite dish, boat and motor rentals, and all the bells and whistles any seasoned hunter (or weekend warrior) might desire. Dare to compare, we promise you’ll be happy you did. 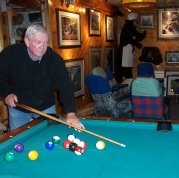 Come enjoy our complementary pool table in the lounge. 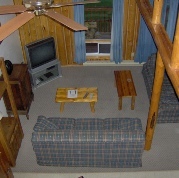 At the Ivanhoe River Inn, guests enjoy satellite television and of course the beautiful wood laden suites. 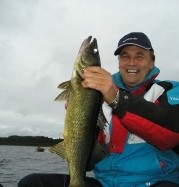 Most of our bear hunters also take time to enjoy the fantastic walleye fishing at Ivanhoe lake. Active hunters generally fish in the morning hours, and once hunters have harvested their animals, fishing becomes a main attraction.